We have a racing club for athletes with a need for speed. 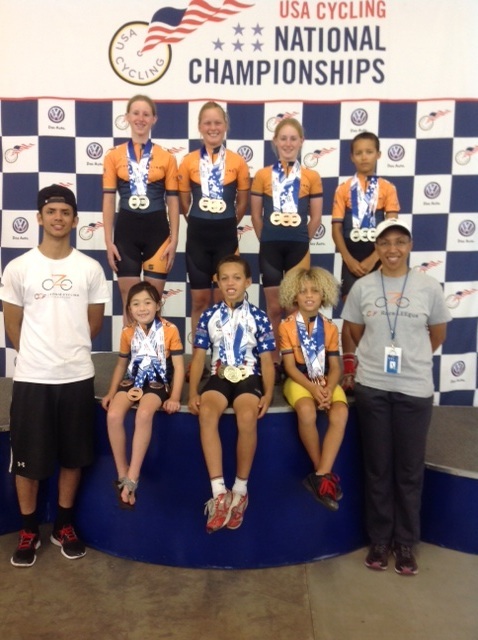 CCF participates in all levels of USA Cycling sanctioned competition, with competitive club cycling for boys and girls. Our race club is registered and in good standing with USA Cycling, the governing body for competitive cycling in the United States. CCF riders have won U.S. National Champion titles, California State Champion titles and consistently rank high in junior competition. ​Our athletes have opportunites to compete in track, road, MTB and other cycling disciplines. ​USA Cycling sanctioned junior events are open to licensed riders age 9-18. The competition season varies depending upon the level of competition and area of the country. The junior cycling State and National Champioship events are held in the summer months, June - August. In Southern California we have competition throughout the year, primarily February through August. ​At CCF, we also run our own Race LEEgue series of races for program participants. The Race LEEgue events emphasize skill development, participation, sportsmanship and camaraderie in a fun competitive environment. It's an opportunity for our more experienced athletes to hone their race skills; while at the same time, it gives rookies a chance to experience the thrill of competition in a supportive environment.